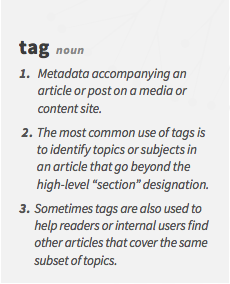 Tagging articles, blog posts and other digital content is worthless! From an SEO/traffic/audience acquisition perspective, at least. That last insight might be surprising. If you’re a content creator, you might be thinking: ‘Great! So we can stop spending time tagging content since it doesn’t make a difference, right?’ Well, not quite. 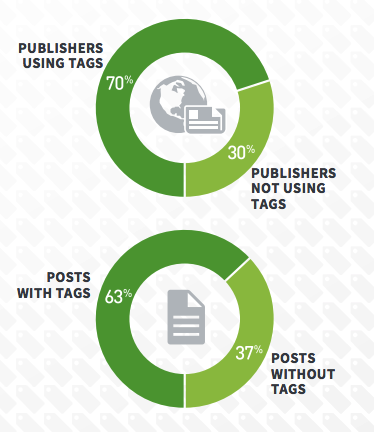 Specifically, the report found many publishers are using tags to classify content formats like stories, quizzes, galleries, videos, paywall protected and sponsored content. The key seems to be setting up axes and groups which will allow for more granular question asking & answering. Take the example offered by Atlantic Media Strategies marketing manager, Joshua Lasky: “There’s a certain amount of content optimization that can be done here. Think if you were to tag articles based on whether they included a video; you could then analyze whether having this element improved article performance. This would help you to decide whether it made sense to embed more videos in the future.” Which is a concise way of explaining what amounts to a clever, data-driven, iterative approach to content strategy. Here at Oliver + Sons, we know we’re excited about these ideas and we’re already working on integrating more intelligent tagging schemes for analytic purposes for our various clients. Drop us a line on Twitter and let us know how you’re using tags.